MUMBAI: India has become so desperate for fresh stocks of the onions it uses in spicy curries that it is turning to regional rival China and sanctions-hit Iran for supplies, and there is even talk of airlifts to ease soaring prices. But despite a swirl of high-level meetings on Thursday, the government is unlikely to land imports in substantial quantities before state elections begin on Nov. 11, with state-run firms struggling to clinch deals and private players risk-averse. Indians eat their way through 15 million tonnes of onions a year, using them as the base for traditional dishes such as biryani and bhaji. This has made high prices a hot potato that has in the past contributed to the fall of state governments. 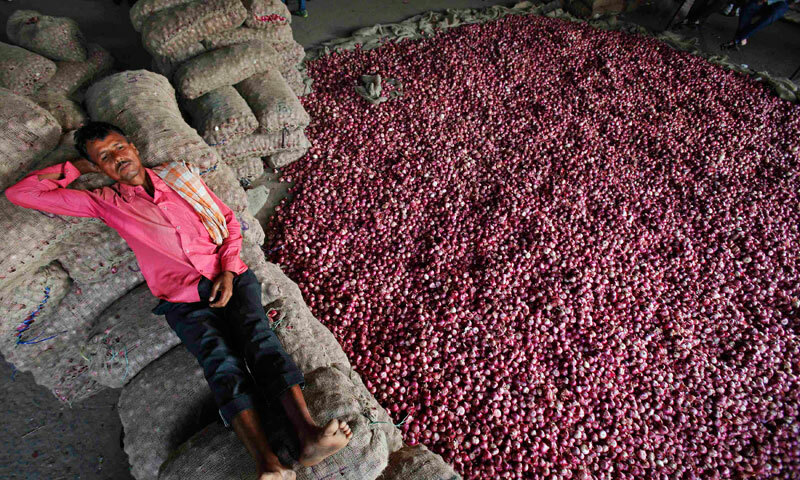 Retail prices of onions have quadrupled in three months � now costing over 100 rupees ($1.62) a kilo, which is what a third of the population live on per day � as a supply squeeze caused by wet weather has hampered harvests. Farm and food ministers met with Delhi Chief Minister Sheila Dikshit in New Delhi on Thursday to discuss ways to curb galloping prices in the Indian capital. Onion prices were a major factor in pushing inflation to a seven-month high in September of 6.46 percent, and the government, led by the Congress party, is facing heated calls in the media to bring prices down by whatever means. India has never before imported onions by air but Farm Minister Sharad Pawar proposed just that on Wednesday because sea transport takes longer and so cannot replenish supplies as fast, thereby bringing down prices. Elections in the capital and in the states of Rajasthan, Madhya Pradesh, Chhattisgarh and Mizoram kick off in November. Private traders won't rescue the world's No. 2 producer and consumer because they know prices could quickly fall - farmers have planted far and wide to reap the benefit of high prices. �Onions are highly perishable. Once you import, you have to sell at whatever price is prevailing in the market. You can't wait for prices to rise,� said Ajit Shah, president of the onion exporters' association. And even stopping exports won't help matters, because they have already shrunk to just a trickle. �Our prices are too high. Buyers are switching to Pakistan and China,� said a Mumbai-based exporter. Indian onions cost $900 per tonne whereas $570 will buy you a tonne from China. Pawar stuck to basic supply-demand economics on Thursday to bring relief. �Supplies from the new season crop would start in two to three weeks and that would depress prices,� he said. He might be disappointed, though. Heavy rains are expected in the next few days in big onion-growing states of Maharashtra, Andhra Pradesh and Karnataka � and that could be disastrous, Holkar said, disrupting harvesting and damaging the crop. �Right now, imports or restrictions on exports cannot change the demand-supply equation. Dry weather for two to three weeks can increase supplies and bring down prices,� said Shah.